Elsie Johnstone discovers India aided by an able driver who miraculously navigates the chaotic craziness of local traffic and a dependable guide who explains some fundamentals of Hindu mythology. This article is the latest in a series of posts Elsie is blogging while traveling in India. Yesterday Graeme enjoyed a massage at the hotel spa. “Tomorrow, before you begin your journey come and I will give you and your wife a complimentary head and shoulder massage,” the masseur suggested. How could we refuse that offer? And it was a wonderful way to start the day. We ate breakfast in the grand hall surrounded by magnificent centuries-old walls and artifacts. It didn’t take much to imagine this place bustling with activity as the royal party prepared for a game of Polo or a day’s shoot. Today there were just us, a party of German tourists and many attentive waiters. Feeling great we settled comfortably in the car and began the tedious trip over rough and busy roads and through dry desert scenery to Jodhpur. For the first half of the journey the roads were very narrow and full of gigantic potholes. We could have disappeared inside them and no-one would have found us for days! There were many buses and other traffic, but only one vehicle could transverse the road at one time. The second section was wall to wall trucks, none of whom followed the simple rules of the road. 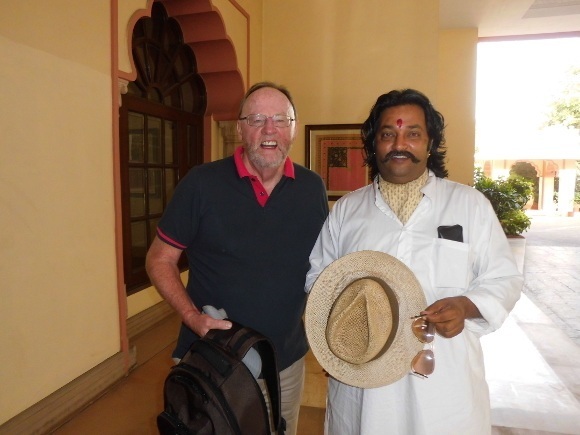 Even though we are experienced drivers, Graeme and I could never have driven in India. We would still have been sitting at the first intersection giving way to the right! Driving here is an art form in itself requiring patience, excellent concentration and a fair amount of local knowledge. Well done to our skilled driver for getting us here safely! After six hours with a break for lunch we reached the city of Jodhpur, which is very clean, tidy and well ordered with many trees and gardens. The hotel, “Vivanta by Taj” is yet another amazing place. Security is strict as we get closer to the Pakistani border so the car has to be scrutinized and our luggage scanned before we enter the gates. The local king resides in his palace but owns and runs the hotel that he built on his land. Its opulence is impressive. After checking in we enjoyed the heat and were lucky enough to be in the pool to observe a desert storm come in from the west, cooling the land and dropping some rain. Tonight, before dinner, we sat in the balmy courtyard while Riyafat Ali, a very amusing magician, entertained us with his craft which has been passed down through the family for six hundred years. He was the best and funniest I have ever seen. We both enjoyed a really good belly laugh. Right from the word go we warmed to our guide, Sandeep Singh Champawat. He presented as slightly eccentric: long hair, straw hat, cravat, long Indian white shirt and an impressive moustache. He was also wearing the trousers that derived their name from the city – jodhpurs. Sandeep’s depth of knowledge was great and his commentary filled a lot of holes in our knowledge of Indian culture. But most of all he was great fun to be with and laughed readily. Many of the houses in the old city are painted in a special paint tinted with a blue that discourages mosquitoes. On top of a hill looking over the ‘blue city’, a bereaved wife dedicated a pure white marble monument to a dead king. 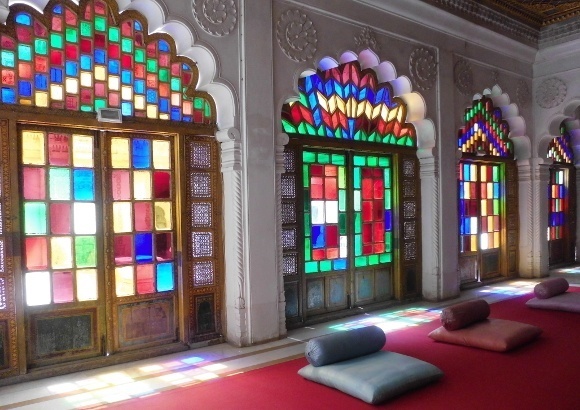 It has developed into a place where Maharajas are remembered. They were extremely benevolent rulers who established excellent educational institutions, roads, hospitals and things that made the hard desert life easier for their subjects. 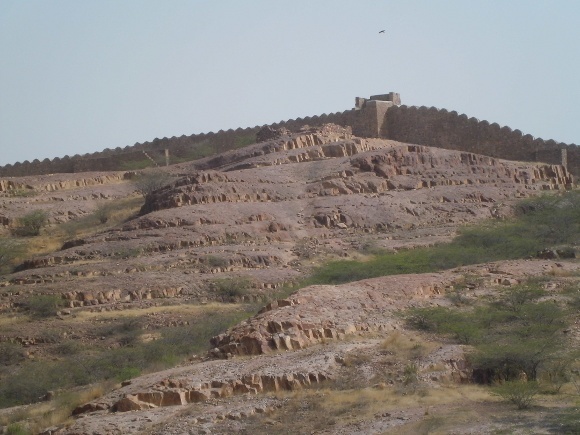 After a visit to yet another extraordinary Fort, this time Mehrangarh Fort, listening to many more stories told in a most interesting way, visiting the old city, the markets and more shopping we were glad to get back at the hotel and out of the heat. In Hinduism, there are all manner of other Gods that people worship at various times and for various reasons. It is the only religion in the world where men and women are valued equally across all areas. Their God is half man and half woman and they rightly believe that man and women cannot thrive without each other. This is represented in their symbol of two intersecting triangles that make a star. Hindus are free chose which of their many Gods they worship. Generally women chose to worship the male God, Vishnu and men prefer Shiva the mother God because this is the Yin and the Yan. That evening, Uma a delightful member of the friendly hotel staff, came to the room to show me how to wear a sari. I went to dinner looking and feeling like an Indian. Experience India in-depth and be enchanted by its magic with our fully customized India tours. Its showing the beauty of the India..awesome. Got more idea about this place.